Webarketing™ is the process of educating your customer to the value you bring to the marketplace! Learn how to use the Elements of Webarketing™ to grow your business revenue. Let That Sales Guy help you attract prospective customers with VizABILITY Marketing! What is the value of that last customer YOU DID NOT GET ? How much revenue did you loose to YOUR competitor THAT DID GET THE SALE ? What if they had called and connected with YOU rather than your competitor ? Suppose they call you at the exact time they are looking for your service ? Let That Sales Guy be your Webarketer™ and do the work for you. 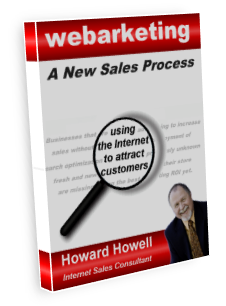 Add him to your sales staff – and let him attract customers who are looking for YOU, using the Webarketing™ Sales Process or learn how to implement this process yourself through an online study course, Web Marketing Workbook. You will learn how to master the art of low-pressure selling (Subtle Selling) and provide your customers with the ability to see you as their “Trusted Advisor“.